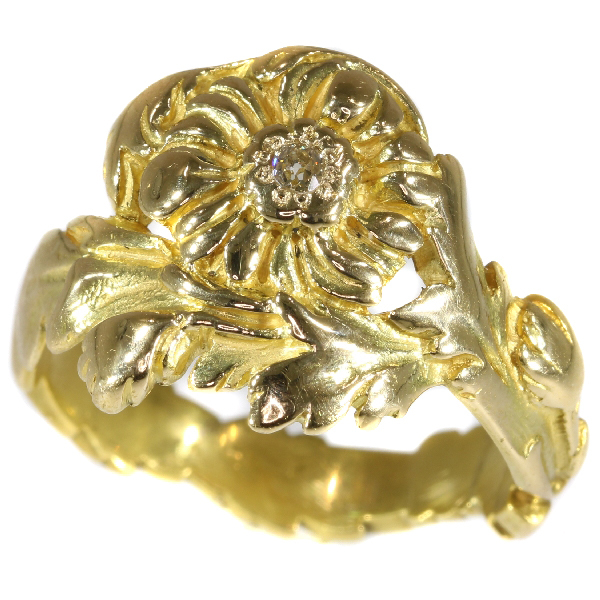 Late Victorian early Art Nouveau flower ring with natural fancy color diamond: Description by Adin Antique Jewelry. Diamond(s): One natural fancy color yellow old European cut diamond with an estimated weight of ± 0.05ct, clarity si. Hallmarks: The French control mark for 18K gold representing an eagle's head that was in use in France from about 1838. And the French control mark representing the head of Mercury that was in use in France from about 1879.